Jesus understood love is greater than fear. The elections in the United States will be over on Tuesday. Now we need to tap into our values to rebuild our communities. In Metropolitan Community Churches (MCC), our Core Values are community, inclusion, social action, and spiritual transformation. These values are rooted in love and the teachings of Jesus. Jesus spoke with strangers, he did not throw the first stone, he healed people and gathered grain when the law and tradition required that he act differently. He acted out of love and not fear. Today, religious majorities and political power challenge the path of the gospel message with fear. Instead of loving our neighbor, caring for the vulnerable, and seeking peace, we have become surrounded by a haze of anger, blame, name-calling, and threats. We are a divided nation. On Tuesday, in every home and business, some will mourn the results of this election while others celebrate. Regardless of what we are feeling, we have a long struggle ahead of us. The struggle is most palpable for people with dark skin. The struggle is palpable for gender nonconforming and transgender, gay, lesbian, bi-sexual people. The struggle is palpable for women and persons of many family formations who long to live and breathe without fear. We have not heard the last of hate-filled rhetoric against people with non-English accents, Muslims, and many others within in the United States seeking a better life. The election results will not clear the air. There is a heavy haze covering our people and land. As people of faith, we are called to address the sources of pollution – racism, misogyny, homophobia, transphobia, mistrust of other faith traditions, anti-immigrant action, and an overall fear of others. We can no longer pretend this haze of pollution does not affect us. What can we do reduce the haze that permeates our nation? Live into the principle of freedom. Honor the freedom to believe and worship without fear of harm. We can do better as people of faith to live into our values. 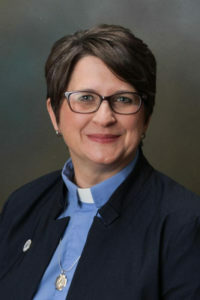 Interim Moderator Rev. 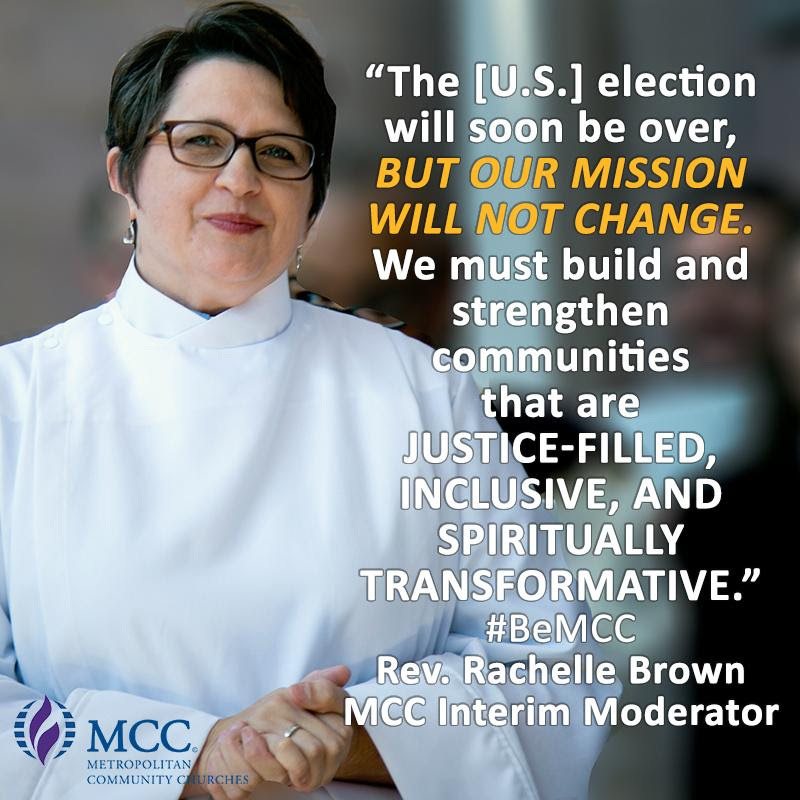 Elder Rachelle Brown, and Communications Team Linda Brenner and Ann Craig, will provide Post Election Talking Points to use with your congregation and in your community. Regardless of which candidate wins, there will still be work to do for MCC. Look for these talking points in your inbox on Monday, 7 November. Join MCC in a Twitter conversation on Election Day using #MCCVOTES. You can also comment about the election on Rev. Brown’s Facebook page: @RevRachelleBrown. Rev. Brown will release a statement to the election via email and social media when a candidate is announced as a winner. Rev. Brown will host Facebook Live in her home near the time the next U.S. president is announced. Go to @RevRachelleBrown to start Facebook Live on Election Night.